Cicada is a picture book targeted at teens and adults about a cicada dressed in a suit and a tie who is unappreciated and abused in his office job. This unusual book comes from Australian literary great, Shaun Tan. Tan is an Australian artist, writer, illustrator and filmmaker who was born in Fremantle, Western Australia, in 1974. Tan has collaborated with several other writers and has also published and illustrated a number of books on his own. His work has received critical acclaim and brought him a lot of award recognition. In 2011 alone, he won the Astrid Lindgren Memorial Award from the Swedish Arts Council for his work in children's literature and also an Academy Award for his work on the film The Lost Thing, which won Best Short Film (animated) at the Oscars that year. Cicada is the first book that he has published and illustrated since the release of the Rules of Summer back in 2013. It arrived with a bang on June 26, 2018, much to the excitement of several local booksellers in my area who posted about it on social media at the time which naturally caught my attention. Cicada tells the story of a well-dressed cicada who has spent seventeen years working in a grey and sterile office environment where the hours are long, the work is boring, and none of his colleagues treat him very well. The story is narrated by Cicada in broken English and the illustrations really help to bring the story alive. Cicada has never had a sick day and he has never made a mistake in his work. But yet despite his hard work, the humans who he works with (whose faces are never shown) do not treat him like a human and do not give him the resources that he needs. One thing that jumped out to me when reading this book was the thread of racism running through it. Cicada describes in one scene how he is not allowed to use the office toilet and is instead forced to clock out of work and take the elevator to the ground floor and walk twelve blocks to use the nearest public toilet. This is an example of segregation and reminded me of real-life instances where I'd read about people of colour being forced into the same situation. The thing I found most impressive about this book were the illustrations. Cicada is not your average picture book. The illustrations are a work of art. The artwork tells you so much about Cicada and his story. The first thing that grabs your attention is its stunning front cover, with the cicada in his suit and tie standing against a grey wall, looking sad and surrounded by pieces of scattered paper. Tan has been influenced by other artists and illustrators and paintings in galleries. You can see this in a lot of his illustrations, in particular, the page where Cicada walks up a long, winding staircase with a look of sadness to him. Cicada is an unusual picture book that would appeal to anyone who has ever been stuck in a boring, soul-sucking office job who has ever wished that they could get up from their desk and leave and never come back. Why? 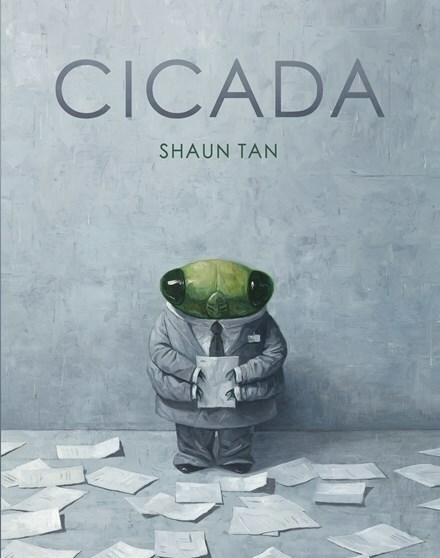 Cicada is a haunting story by award winning Australian artist, writer and film maker Shaun Tan that will resonate with anyone who has ever been stuck in a bad job with people who do not appreciate them. When: Cicada would be a good book to read to kids to start a discussion with them about bullying and racism and mental health and the refugee experience.